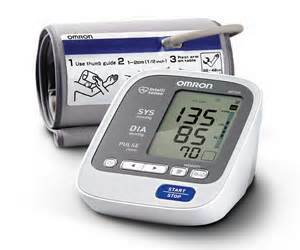 Offering precision and comfort with our Easy-Wrap ComFit™ Cuff that fits standard and large arms, the Omron 7 Series™ home blood pressure monitor helps ensure consistent precise readings with our advanced accuracy. This model offers precision and comfort, with an accurate but simple interface. And with the touch of a button you can learn all you need to know about your blood pressure, and be assured your numbers are accurate. Includes: unit, ComFit™ Cuff (fits arms 9" to 17" in circumference), instruction manual, quick start guide, 4 AA batteries. Feel empowered by accuracy with technology that automatically displays the average of your last 3 readings taken within the last 10 minutes and detects irregular heartbeats. Track your health with increased memory storage allowing you to monitor and store the last 120 readings for more than one person.